and Expert Babysitting Certification, too! Save Each Life is in business to help each student, each RN, each caregiver, each person get the hands-on training when they need it. We DO NOT cancel CPR classes once you paid. Yes, if you need to get certified today or tomorrow, we will schedule the time and location most convenient to you. Money Back Guaranteed. Prices subject to change. 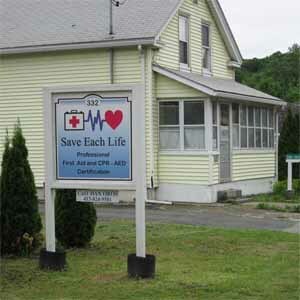 Greenfield – Save Each Life, 332 Deerfield St, Greenfield, MA 01301, on April 25, 2019 – we offer morning and evening classes here. Not sure which class to take? Call us at (413) 824-9581 (or send an email to [email protected]) and we’ll help you decide what’s best for you. To register, click on the location above. We offer the National Safety Council (NSC) training materials and certification, (one of the three nationally accredited First Aid and CPR/AED certification Companies), and you will enjoy the hands-on, to-the-point, intensive training presented in an instructive, enjoyable and guaranteed-to-remember way. NSC is approved in all 50 states, and the Massachusetts link is available here. You won’t feel rushed nor bored. You will have enough practice on the mannequins until you know that you know to save lives. How does National Safety Council compare to the other Training Companies? Why Choose Save Each Life? 1. Class or Private Training – Your Choice! Class Training. Some people prefer to learn First Aid and CPR together with other people. If you would like to save some money, and can register for the next First Aid and CPR class, this is your choice. We don’t cancel classes, even if only one person registers for that day. (Did you know that most companies DO NOT ALLOW one-on-one certification, and will cancel a class if they don’t have a minimum number of participants registered? We don’t). Save money with class training! We are here for you, specially if you have an interview for a new job on Monday, or if your certificate expired yesterday and you may not work until you have the new one! For your convenience, we regularly schedule class training in Amherst, Boston, Greenfield, Fitchburg / Leominster, Northampton, Pittsfield, Springfield and Worcester. Private Training. Other people feel more comfortable learning on an one-on-one basis. If that’s you, good news: we understand that, and offer private training at your location in Amherst, Greenfield, Fitchburg, Leominster, Northampton, Pittsfield, Springfield, Worcester, all the way to Boston, and anywhere in between. Our instructors have been CORI-ed. Just think: no driving to our location, no additional driving time and gas money, no babysitters to hire – we will go to your location with the mannequins, all training material, and your certificates printed. The most convenient choice for you! No other company does that! Save time with private training! Most reputable training companies charge more that $90 for CPR certificate, and $90 for the First Aid. We offer both certificates for only $100 – but that’s not all. You can save an additional 20%, just by using a CPR Voucher. That means, if you buy a CPR Voucher (Gift Certificate) for CPR only, or for First Aid only, you pay $60 instead of $75; if you want both First Aid + CPR/AED, or Pediatric First Aid + CPR/AED, or even the Basic Life Support (BLS, also known as Professional CPR) for Health Care and Professional Rescuers, you pay only $80 instead of $100 (again, that’s a 20% additional discount). You can use the voucher for yourself, or send it as a gift certificate for a friend or family member. After you buy the CPR Voucher, we will contact you to ask how you want it delivered or used. Ready to save? Click here. If you already took any class with Save Each Life (we really mean ANY, even Babysitter Training! ), you are entitled to get a discount for any additional training you take with us. 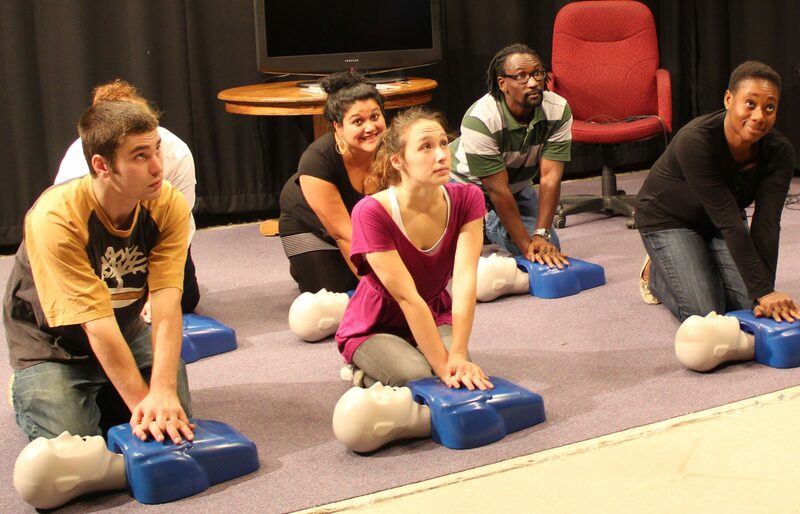 The CPR (only) re-certification is $65, the First Aid + CPR/AED or BLS is $80. Click here to go to the Re-certification page. When you take the certification, you will receive the workbook, some additional handouts, and a DVD with the same video segments you watch in class. National Safety Council is the only company (as far as we know) to include the full DVD (or link to download) training in the certification package. The DVD is yours, and we strongly encourage you to watch it again, at you leisure. You could even show it to family and friends, babysitters you might hire, and anyone else who could benefit from learning First Aid and CPR. (Is it REALLY anyone who could NOT benefit?). Most companies will mail you the certificate within two weeks after you get the training. We will give it to you right after you finished (if we have your name in advance)! You can show it on Monday at the job interview, or finally open the daycare at your home! 6. Registered Today – Trained and Certified Today! Because you need the certification as soon as possible, we offer private classes when you need them. That means, if you call us today, you might get the training today (if no one else booked us – it’s first come, first served). Depending on your certification needs, you could get everything done the same day. And yes, we work on weekends, and have done CPR training occasionally at night (the class started at 10.00 p.m., and ended way after midnight!). Do you know any other company to offer that? Since CPR Certification is a required thing (and not optional), most people are bored even before starting the class. And if they took the previous training online or with a video presentation where the instructor was physically present but boring, they dread doing it again. We are at the opposite end of the spectrum. Our instructors make the training enjoyable, with many real-life scenarios, questions and answers from previous students, added information from latest reliable sources, and a real defibrillator demonstration. Since your time is valuable, we don’t hold you more than necessary to learn. We will, however, answer all your questions, listen to all your comments or things and concerns you want to share, and give you all the time you need to become proficient on the CPR technique on the mannequins (did we mention this is a hands-on training?). In Massachusetts, all professionals must get hands-on training, based on the latest guidelines from the International Liaison Committee on Resuscitation (ILCOR) as published by the American Heart Association, in order to be considered properly licensed. We offer the hands-on training to everyone, not only to the professionals, because this is the best way to learn (and remember a longer time). And although you get a ton of information in a short period of time, nobody expects you to remember everything, but you take the workbook and DVD (or link to download) with you, so you can review it at your convenience. And feel free to refer us, if you agree that you received an excellent service! Click here to see our address on Google Maps. We have a D-U-N-S number (from Dun & Bradstreet), available upon request. For more information, call Dan Oros, Training Coordinator, at (413) 824-9581.